When I first started to photograph weddings, I LOVED the typical “shot list” I found on wedding websites; as I worked on gaining experience, this list helped me double-check myself and make sure I was getting everything I needed to present a thorough collection of wedding day images to my clients. After shooting maybe five weddings, I ditched the list. I felt confident that I knew the important shots needed at most, if not all, weddings. Part of what excites me about wedding photography is that every wedding and every couple are so different that I’m never bored with my job. Everyone has a different story and one of the best characteristics of the modern wedding (in my opinion) is the customization of details to reflect the personalities of the bride and groom. I love to hear about those details! It’s even part of my initial “contact me” form on my website. I want to start talking to you about your wedding and why it’s special. Right now. 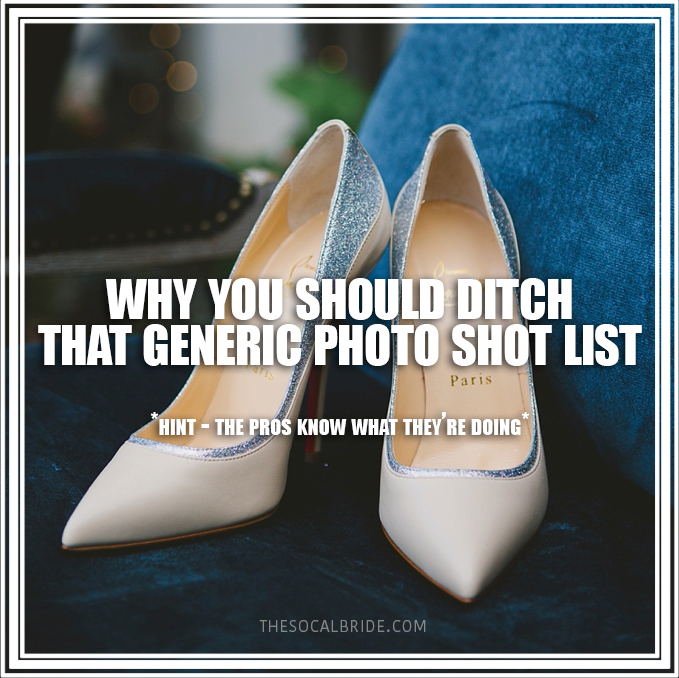 That said, the moments included from a generic, overly-thorough “shot list” downloaded online are pretty predictable for every wedding (with a few exceptions as couples start to ditch traditions like the bouquet and garter toss, or opt for a dessert buffet instead of a cake that needs cutting). It almost hurts my feelings when a couple sends me a shot list of the basics, like I need to be reminded that the first dance or the ceremony processional is something important that should be photographed. I know that already. Let me put it to you this way: as wedding photographers, we know that we’re supposed to snap photos of the basics. These include the various “getting ready” shots (bride getting into her dress, groom straightening his tie, etc. ), the look on the groom’s face when he sees the bride walking down the aisle, parents crying, the first kiss as husband and wife… the flowers, the centerpieces, the cocktail menu, and every little detail you put into making sure your wedding day is as beautiful as possible. I DO understand that couples have had bad experiences with their wedding photographers and that’s why those standard “shot lists” exist in the first place. We know that you haven’t done this whole wedding thing before so you just want to be thorough and leave nothing to chance. But if you trust your photographer, have stalked their photo blog, and looked at sample albums during your consultation with them, and you’re happy with what you see, you’re in good shape. Also, a side note: all your wedding vendors are human beings. No one is perfect. 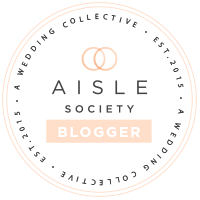 We are in the wedding field because we LOVE weddings; they get us all giddy and excited and we care about working hard to make sure your day is awesome. That said, something WILL go wrong. The sooner you accept that something (hopefully small) will go awry on your wedding day, the more you’ll actually enjoy yourself, because you won’t get worked into a tizzy about whether your mother-in-law got a wrist corsage instead of a pinned one. Similarly, we will do everything we can, as photographers, to get every shot of your dress, shoes, jewelry, hair, makeup, walk down the aisle, first kiss, bouquet toss… but sometimes your uncle Joe steps into the aisle and blocks us and we’ll still do what we can to get the shot, but it may not be perfect. Or it’s going to be raining on your wedding day so we really can’t take your dress outside to hang from a tree. See what I mean? If there are special moments about your wedding day that are unique, it’s completely fine for you to mention these details to your photographer. If your grandmother’s blue handkerchief is sewn inside your wedding dress, or you’re planning to pull your mother aside during the reception to give her a special gift in private (and want that moment photographed), we’ll want to know about it so we can be on the lookout. Giving us a heads-up on special moments that are atypical of most other weddings is encouraged! That helps us out a lot! That is not what we’re talking about here. We’re talking about the list of traditional moments that are part of almost every wedding we photograph, thus we don’t need to be reminded of those moments. We get it, we know about them, it’s going to happen. When in doubt, give your photographer a call or send an e-mail that acknowledges you trust his/her expertise, but just want to make sure he/she knows that your ring is a family heirloom so it’s especially significant and is a photography priority. There is a fine line between communicating with your photographer about what’s important to you, versus the risk of insulting them with a long list of the obvious. There is something else I’d like to clarify here: there will be special moments at your wedding that can’t be planned or staged. I’ll definitely get a shot of that blue handkerchief of your grandmother’s we talked about earlier, but what may end up being your favorite photo of the day is one of your flower girl caught dancing to her favorite Lady Gaga song. Or whatever. The organic, spontaneous moments of you, your new spouse, and your friends and family celebrating this occasion are one of the biggest reasons I love being a wedding photographer. Some “shot lists” actually have items like, “groom with his arm affectionately around best man.” If the groom and best man aren’t apt to put their arms around each other, you’ve either set up your photographer for failure, or you’re encouraging your husband-to-be and his bestie to behave unnaturally, and that is going to show in the photo. Now, you will also see photos on Pinterest that make you swoon. You will see photos that you’ll want to copy. But here’s the catch: the original image probably wasn’t planned. It was a moment that was organic to that couple on their wedding day. 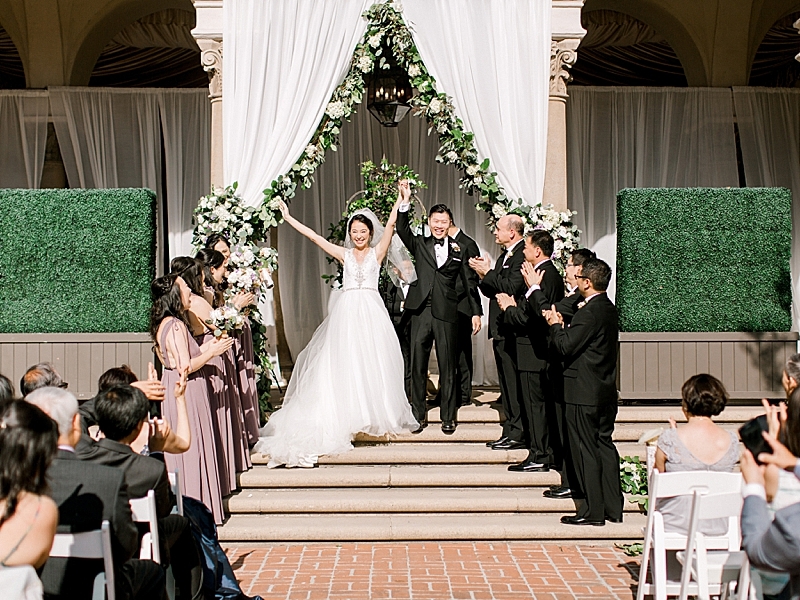 While you are trying to mimic the magic of someone else’s wedding, you could be missing out on the opportunity for your own extraordinary moments caught on camera. That’s something else to consider if you still want to hand over an itemized list to your wedding photographer: try not to stage everything. So many couples say they want a photojournalistic approach, but then want to manipulate their photo memories to mirror what they’ve seen elsewhere. Let the day happen naturally and the photographer you hired because you love his/her work will do the rest. "My name is Emily, but the photography is “Anna Delores.” My maternal great-grandmother’s name was “Anna” and my paternal grandmother’s name was “Delores.” I thought a salute to my heritage was appropriate; after all, my intention is to create imagery that will be part of your family for generations to come. I'm a resident of Ventura County, CA and a strong believer in coffee, eating dessert first, and candid photo ops. I’m convinced I have the best job in the world for getting to do what I do. It’s an honor for me to be there on your wedding day; it’s a wonderful gift and I don’t take it lightly."